American Trucking Associations has formally launched its campaign in support of a federal infrastructure funding package. The purpose of the campaign is to urge Washington lawmakers to work together and develop comprehensive legislation to fund infrastructure projects. ATA President Chris Spear kicked off the campaign during a teleconference with media representatives April 3. ATA’s push includes an eight-week advertising run. The advertisements will be broadcast on the internet and television in the Washington area, as well as over social media. ATA also built a website, RoadToABetterFuture.com, to support this cause. ATA’s minute-long commercial shows three people who miss family obligations because they’re stuck in traffic. A man is late to the hospital where his wife is giving birth to their child. A mother doesn’t make it on time for her son’s homecoming party celebrating his return from military service. A father misses his young son’s baseball game. Spear said the commercial depicts the toll that poor infrastructure and congested roadways have on people’s personal lives. While the advertisements will begin their run in Washington, Spear indicated that they may be expanded to other regions, such as districts of key lawmakers and areas marked by severe congestion. 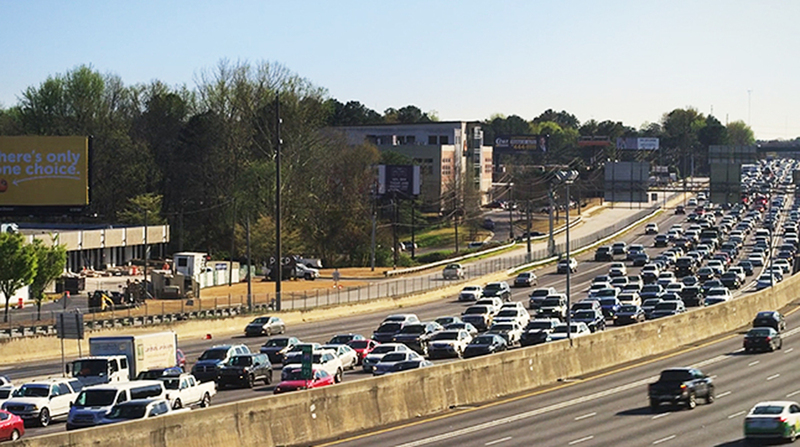 He mentioned that ATA likely will use the American Transportation Research Institute’s list of top truck bottlenecks, which pinpoint Atlanta and Fort Lee, N.J., as critical pinch points, as a guide. In addition to the advertising campaign, ATA will be orchestrating in-person visits among trucking industry leaders and members of Congress to generate support for infrastructure legislation. Throughout April, May and June, some 18 state trucking association executives — who together represent 2.6 million trucking jobs — will fly to Washington to meet with their representatives. Spear specified lawmakers on the House Ways and Means and Transportation and Infrastructure Committees — chaired by Richard Neal (D-Mass.) and Peter DeFazio (D-Ore.), respectively — as key targets for the campaign. ATA also is planning local events in congressional districts across the country that are hampered by congestion. Such events include ride-alongs with members of Congress through the country’s worst traffic bottlenecks. Spear said ATA’s push has garnered support from other trade groups. ATA is one of many associations that support finding a revenue stream to counterbalance the flagging federal Highway Trust Fund, which helps states with construction and maintenance projects and relies heavily on the federal fuel tax. The federal fuel tax has stagnated at 24.4 cents a gallon for diesel and 18.4 cents a gallon for gasoline since 1993. During his testimony before the Senate Commerce Committee on Feb. 13, Spear promoted ATA’s Build America Fund as a financing solution. The Build America Fund would be backed by a 20-cent-per-gallon fee incorporated into the price of transportation fuels gathered at the terminal rack at 5 cents per year over four years. This fee would be indexed to inflation as well as improvements in fuel efficiency with a 5% annual cap. During its first decade, Spear said, the program would be capable of generating about $340 billion. Spear said he’d like to see an infrastructure deal passed before the end of 2019. He noted that the package’s success depends on the support of a split Congress and President Donald Trump.